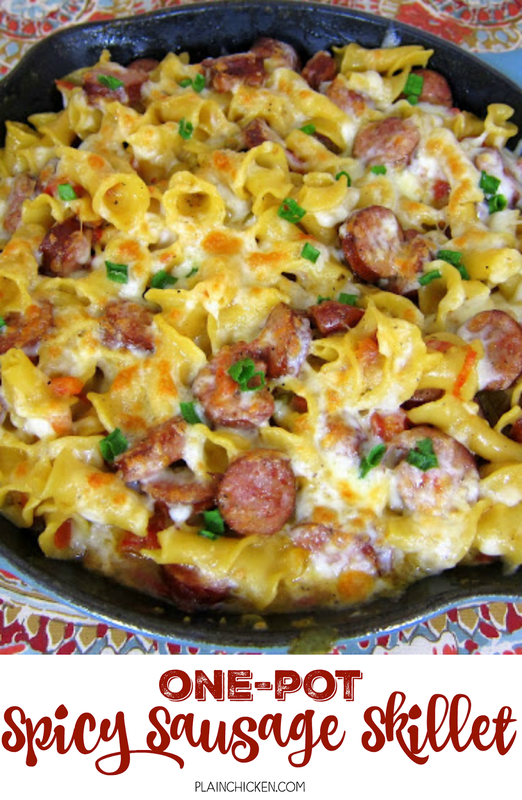 One-Pot Spicy Sausage Skillet - smoked sausage, chicken broth, cream, pasta, rotel, cheese and green onions. Everything cooks in the same skillet, even the pasta! Quick recipe! Ready in 15 minutes! My husband asked for this 3 days in a row! OMG! This was SO good! The best part of this meal is that it only uses one pan. The pasta cooks while it simmers in the sauce. Yay for less dishes to clean!! Our pasta was super spicy. I sent Chicken Legs to the grocery store and he bought Hot Rotel. Let me tell you, Hot Rotel is super spicy! Fortunately, we both like spicy food! I decided to splurge on calories and used Conech Smoked Sausage. It had great flavor and smelled wonderful cooking. Feel free to substitute smoked turkey sausage if you want to cut down on the calories. This makes a ton. We saved the leftovers for lunch. I poured a little chicken broth in the container so the pasta wouldn't dry out when we reheated it. It was just as good leftover. Heat olive oil over medium hight heat in a 12-inch oven safe skillet until hot. Add sausage and cook until lightly browned. Add onion flakes, garlic powder, broth, tomatoes, cream, pasta, salt and pepper and stir. Bring to a boil. Reduce heat to low and cover skillet. Simmer for 15-20 minutes, until pasta is tender. Remove skillet from heat and stir in half of the cheese. Top with remaining cheese and sprinkle with scallions. Broil until cheese is melted and bubbly. Perfect week-night dinner. I love a one-pot-dish! I would stand at the stove and eat this right out of the pan with a fork. Whoops, don't tell anyone I said that :) Looks D-lish!!! When I looked at the picture, I instantly wondered if I could use Conecuh and you answered the question for me. I love Conecuh. I like spicy food too. After seeing this yesterday, I had to make it last night - my husband and son LOVED it. I made very slight modifications (using what I had in the pantry, lol) - evaporated milk instead of heavy cream, mild Rotel, and shredded pepper jack cheese. I think this will become a 'go to' recipe for busy nights and hungry men, thanks! From just the pic, I was going to say OMG that looks so good and with your OMG on the taste, it is an obvious must try. Have a Happy Thanksgiving. Dan's parents brought us some more sausage this week from Montgomery, YAY! Just made this tonight, and it was SOOO good (and so easy)! I pretty much followed your recipe, but used minced garlic since I had no garlic powder. I was surprised at how spicy the Rotel made it. A long time ago Ruby Tuesday's had this southwestern chicken pasta that I could never replicate, but this would work perfect, just with chicken, black beans, and a some fresh tomato when you serve it. 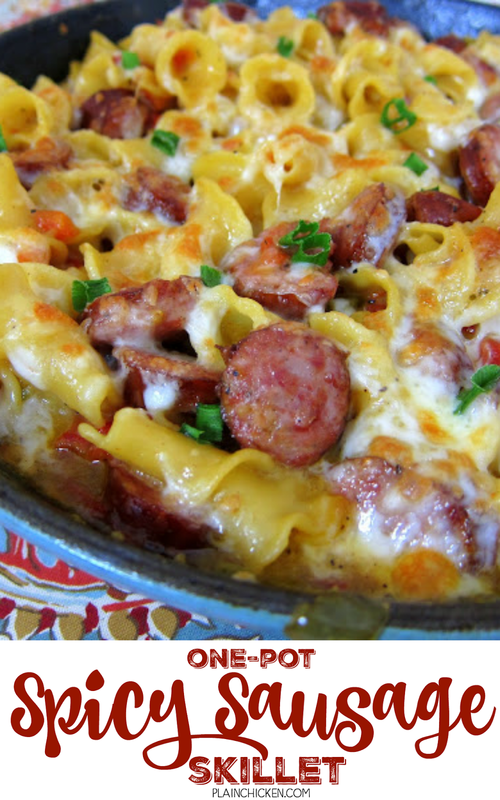 Love the look of the dish; perfect for my comfort-food loving husband! Think I will make it tomorrow night when he comes home from a business trip. Oh, the tablecloth is gorgeous as well. Source? Jennifer - hope you like the pasta! I got the tablecloth at Pottery Barn. I decided to make this dish for supper tonight because the picture looked so good, and it was DELICIOUS! It was creamy and cheesy, BUT, it was too spicy for me. I need to know it is was the Rotel or the Conecuh Sausage making it so spicy? ! This was delicious!! I used chicken sausage and mild rotel, it was a perfect weeknight dish, I can't wait to have it again! This is absolutely one of my new favorite recipes. My husband has requested this 3 times in the last 2 weeks! Omg! This is one of the best recipes I have tried. Husband went back for 3rds! Took leftovers to a friend and she and her sister both asked for recipe. Making again next weekend to take to another friends (oyster roast) since I don't like oysters, I'll have something wonderful to eat. Thanks Stephanie! Keep up the great work with these recipes. This was a wonderful recipe. I made it for our weekly lunches and it reheated beautifully. It paired perfectly with roasted broccoli. This was very good. My high school daughter took leftovers to school and her friend's commented that it tasted like it came from a restaurant. I made this for my family last night and everyone loved it! My husband said, "That's a keeper!". Love this receipe!!! Making it for the 2nd time tonight. Doubled it since there were hardly any leftovers the 1st time I made it. Has anyone tried this with roasted chicken instead of sausage? May have to try that the next time!! Its a keeper for sure!! So so good!! This could be made gluten- free too! I used fresh onions and garlic, cut the broth down to 1/2 cup, and used zucchini noodles instead of pasta. Really good! I do think next time I'll cut the broth out completely. It was still a bit soupy since zucchini doesn't absorb the water like pasta does. The flavor is really good though! 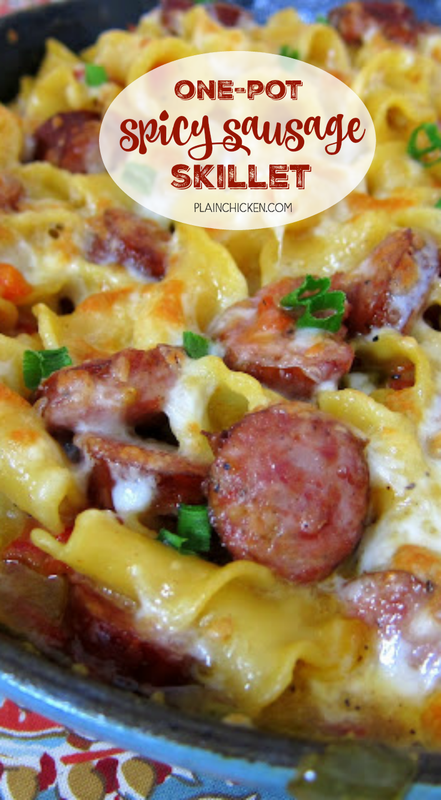 I made this quick and easy one-dish meal tonight! It's delish!